Welcome to Okanagan week here at CBL! As you know, I recently returned from a whirlwind tour of the Okanagan, and I want to share some of those destinations with you this week, as well as recipes inspired by the places I visited. Today is inspired by breakfast, Wednesday’s will be inspired by lunch, and Friday’s will be inspired by dinner. We start in Pentiction, at the Lakeside Resort. 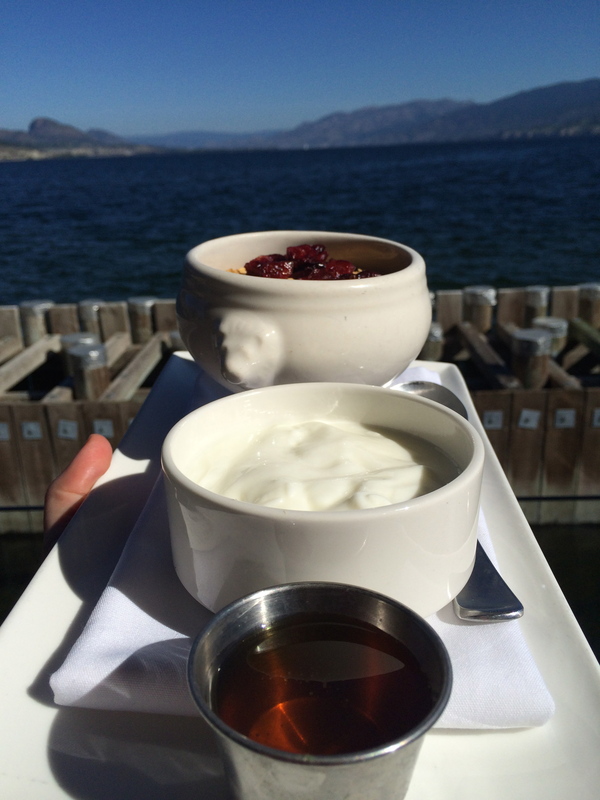 Not only is it a hotel, it houses a private marina on Okanagan Lake, a conference centre, and three restaurants (I didn’t stay there, but Marc Smith did–you can read his review here). We got to have breakfast here, at the Hooded Mergancer Bar and Grill. 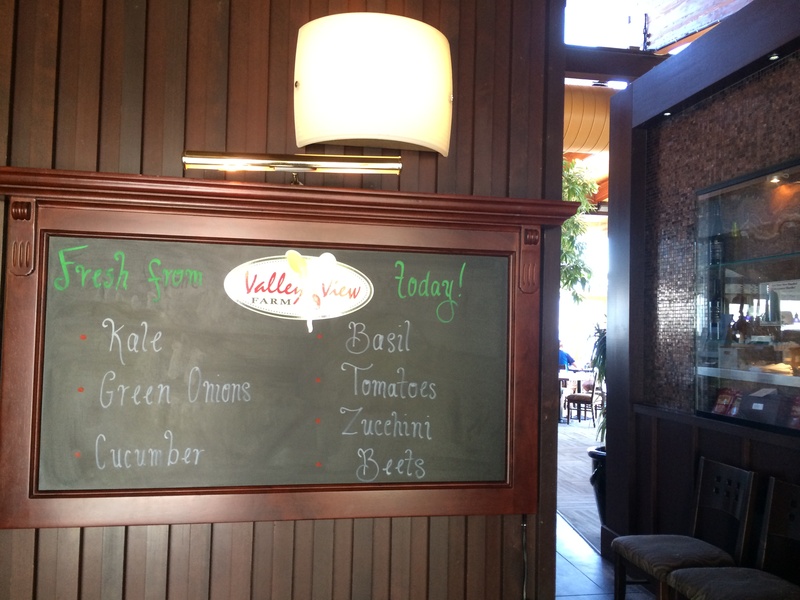 Chef Chris’ Herb Garden–just steps from the kitchen! The hotel is built right out over the water, so you can sit outside and watch the waves and boats and water skiers while you enjoy your meal. 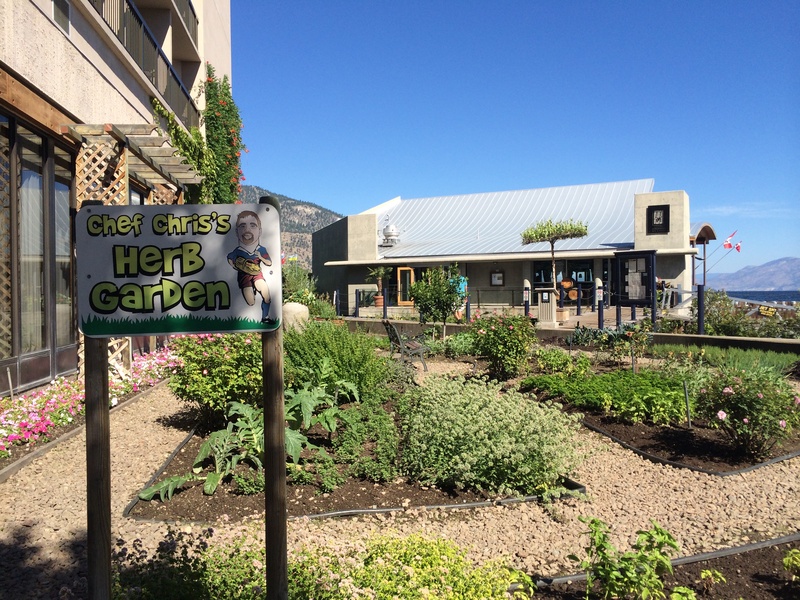 Growing conditions in the Okanagan are so rich, that more restaurants than not have their own herb gardens. The Pentiction Lake Resort takes it one step further, however. They have their own farm to supply fresh produce to the hotel’s restaurants. They grow a huge variety of their own fruits and vegetables, and post what’s come in from the farm to be integrated into the menu that day on a blackboard. They also have an apiary and make their own honey. I had some of this liquid gold with my fruit, yogurt and granola for breakfast, and I loved it so much, I came home with some. I halved and stoned some golden plums, and then drizzled them with the honey. I then laid some sage overtop (an homage to Chef Chris’ herb garden right outside the restaurant), and then roasted them in the oven until they were soft and a bit caramelized. 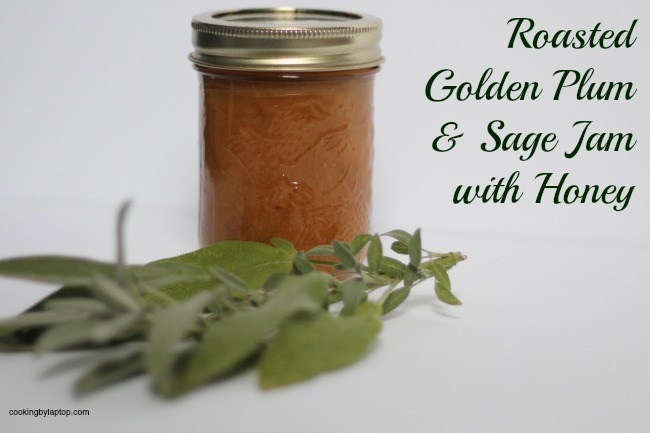 The honey and the roasting helps to bring out the sweetness of the plums in these preserves, and the sage adds a subtle earthiness to the final product. This jam would be great simply spread on toast, or served with a soft cheese and a baguette. Wash the plums well, and halve them. Remove the pits. Line a large baking sheet with aluminum foil. Place the plum halves, cut side up, on the baking sheet. Drizzle honey all over them, using up about 2 tbsps of it. Save the rest for later in the recipe. Sprinkle with a little sea salt. Place the sage sprigs on top of the plums, and then roast in a 375 degree oven for about 20-30 minutes, until the edges are browning, and they look caramelized. 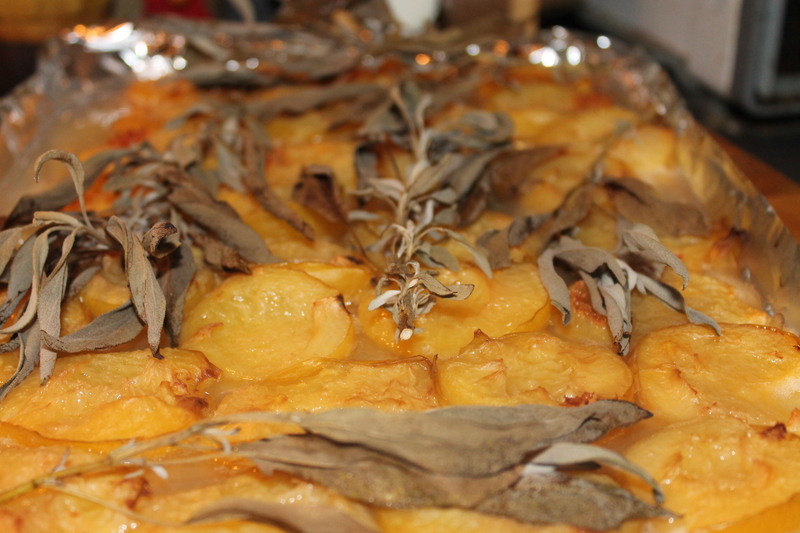 Remove from the oven, and remove and discard the sage. Allow to cool slightly, then place the plums and the reserved juices in a blender, and pulse just once or twice. You want to break the plums up, but you don’t want to puree them, you want to leave some chunks of fruit in the jam. Add the plums back into a large pot, and add the rest of the honey, the water and the lemon juice. Bring to a boil, and allow to boil for about 10 minutes, or until the temperature registers 220 degrees on a candy thermometer. The jam is, at this point, done. If you want to preserve it, do so according to manufacturer’s recommendations. Otherwise, ladle into jars or plastic containers, and keep in the fridge until you can use it. Very innovative recipe! Definitely adding to my cookery book. Since my family had to move onto gluten-free diet couple of weeks ago, I am trying to collect as much information and as many recipes as I can. It is quite hard though! And completely different from what we were used to. In addition, I have learned not even restaurants can be trusted. Apparently, not all the ones who claim they cook gluten-free meals, in the end do (you can read all about it in here for example, very interesting Gluten Free Restaurants ). It is outrageous, isn’t it?